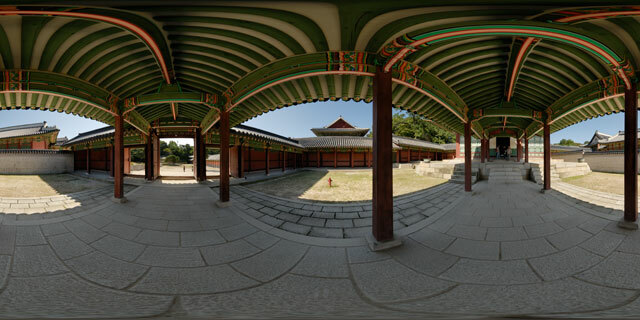 360° VR panorama in the south-west corner of the Nakseonjae complex of Changdeokgung palace, in Seoul, South Korea. Nakseonjae was originally built in 1847 as a library and living quarters for King Heonjong. Reflecting King Heonjong’s sense of style, Nakseonjae lacks the colourful Dancheong painting that decorates the majority of palace buildings. During the Japanese occupation of Korea the buildings and walls surrounding Nakseonjae were removed. As part of a restoration project started in 1991 to restore Changdeokgung to its original state, Nakseonjae was restored in 1996. 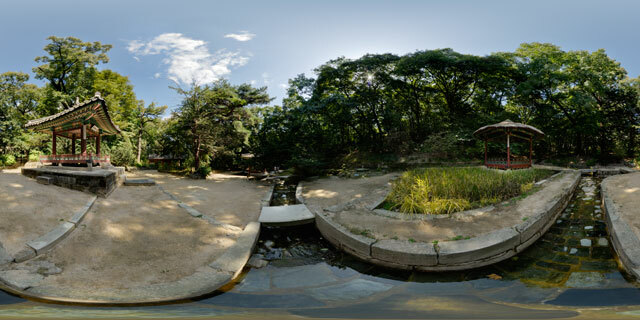 360° VR panorama from the north bridge over Geumcheon stream, which separates the east and west sections of Gwolnaegaksa, in Changdeokgung palace, Seoul, South Korea. Gwolnaegaksa was an area of Changdeokgung where government offices closely involved with the the royal household’s affairs were located. In the east of Gwolnaegaksa were located Naeuiwon (Royal Pharmacy), Hongmunwan (Office of Special Advisors), and Geomseocheong (Publication Office). While to the west was Gyujanggak (Royal Library) and Bongmodang (Hall of Upholding the Policies of Former Kings). Here you can see Chaekgo, some smaller library buildings located in the north-west of Gwolnaegaksa. Gwolnaegaksa was destroyed and paved over with roads during the Japanese occupation, the current buildings were restored between 1991 and 2005. 360° VR panorama of Unhanmun and Bongmodang, in Changdeokgung palace, Seoul, South Korea. Although most government buildings were located outside of the palace, those closely involved with the royal household’s affairs were built on the palace grounds. They were located in the west of the palace, and collectively known as Gwolnaegaksa. Unhanmun and Bongmodang are in the north-west of this area. Unhanmun is a large gate (closed in this photo), while Bongmodang was the Hall of Upholding the Policies of Former Kings, where documents relating to the former rulers of the Joseon dynasty were kept. To the left of Bongmodang is Chaekgo, a library building where books were stored. The large tree is a Chinese Juniper, thought to be around 750 years old. Juniper wood was used to make incense which was used in ancenstral rites at the nearby Seonwonjeon shrine. 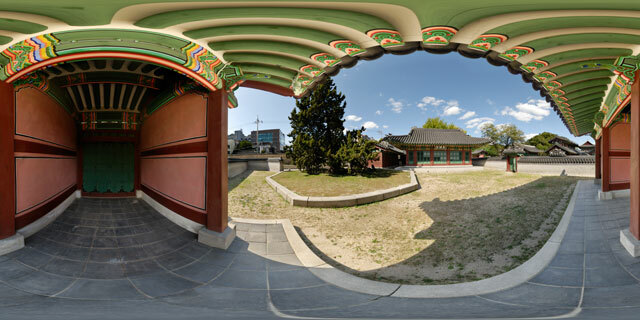 360° VR panorama of Ongnyucheon, Taegeukjeong, and Cheonguijeong, in the rear garden of Changdeokgung palace, Seoul, South Korea. The Ongnyucheon area was a place where the king would sometimes hold parties. Wine cups would be floated down the stream, and then the recipient would have to drink the wine and compose an impromptu poem. Around the stream are located small open pavilions allowing the viewer to enjoy the garden from any direction. Taegeukjeong pavilion symbolizes the state of perfect harmony, with yin and yang in balance. Cheonguijeong is the only existing thatched pavilion left in the grounds of Changdeokgung. In front of it is a small rice field, the king would farm rice to aid his understanding of the hard work of farmers and show his solidarity with the farmers. The dried rice plants would be used to thatch Cheonguijeong. 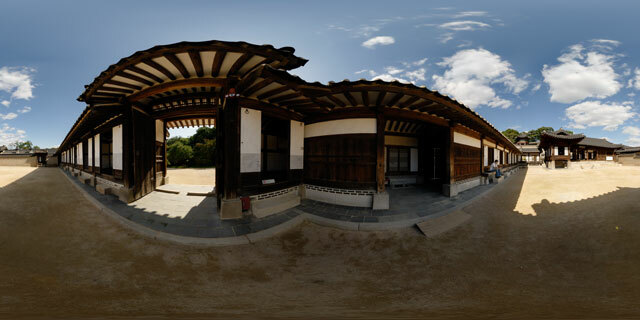 360° VR panorama at the back of Huijeongdang, in Changdeokgung palace, Seoul, South Korea. Huijeongdang was originally the king’s bed chamber, but was later used as the king’s main adminstrative office. The building was destroyed by fire in 1917, and was then rebuilt, but in a style quite different to the original building. The original Huijeongdang had a stone floor set on stone pillars and a pond in the courtyard, while the new building has a wooden floor and many other western features such as carpets, glass windows, and chandeliers. To the north of Huijeongdang is Seonpyeongmun gate, which leads to Daejojeon, the queen’s residence. 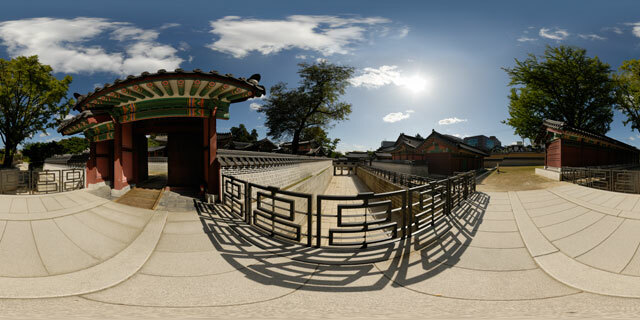 360° VR panorama outside the front gate of Huijeongdang, in Changdeokgung palace, Seoul, South Korea. Huijeongdang was originally the king’s bed chamber, but was later used as the king’s main adminstrative office. The building was destroyed by fire in 1917, and was then rebuilt, but in a style quite different to the original building. The front porch is built so as to enable a cart or car to park underneath it. Changdeokgung was a royal palace built during the Joseon dynasty by King Taejong in 1405. In 1997 the palace was designated a UNESCO World Heritage site. 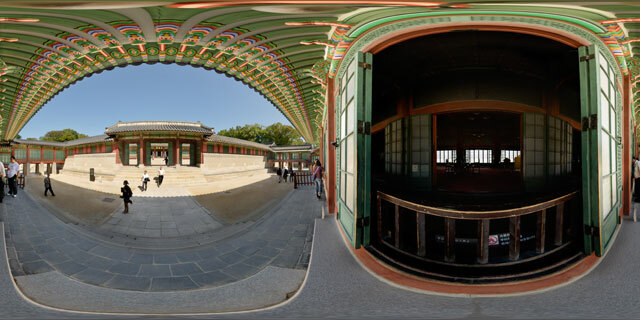 360° VR panorama under Bokdogak, a collonaded passageway that leads to Seonjeongjeon hall, in Changdeokgung palace, Seoul, South Korea. Seonjeongjeon was used by the king to discuss state affairs with government ministers and officials. The collonaded area surrounding the building was used for storage and as offices for clerks. Seonjeongjeon was also used as a shrine for part of its life, holding the ancestral tablets of deceased kings and queens. The corridor is today the only remaining evidence of its function as a royal shrine. The gate at the south is called Seonjeongmun gate. 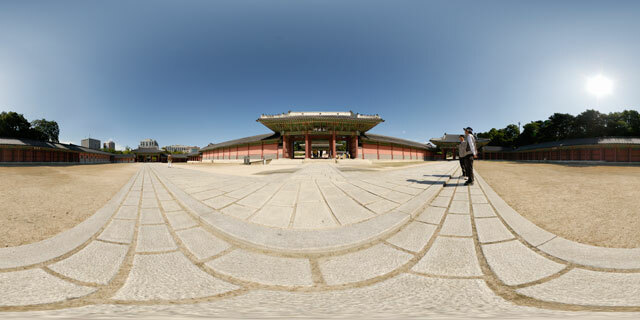 360° VR panorama of the outer courtyard area in front of Injeongjeon, the throne hall of Changdeokgung palace. Changdeokgung, located in Seoul, South Korea, was created as a secondary palace by King Taejong in 1405. To the north is Injeongmun, the gate that leads to the inner courtyard and the throne room. To the east is Sukjangmun gate, while to the west is Jinseonmun gate. The outer courtyard is enclosed by a colonnaded structure that was used for storage and guard posts. To the south, the east part of the colonnaded building is Sangseowon, while the west part is called Howicheong. The section to the north-west, just above Jinseonmun, is Jeongcheong. Standing nearby are two employees of the palace, which is owned by the South Korean government. At the top of Injeongmun, on the roof ridge, can be seen some copper plum motifs. These were added during the Japanese colonial period. 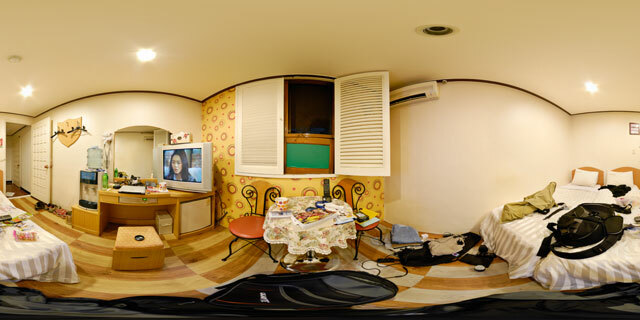 360° VR panorama of a twin bed hotel room at the Hotel Biz Myeong-dong (호텔 비즈 명동), in Seoul, South Korea. The Hotel is located in Euljiro 3(sam)-ga, and is only a few minutes walk from the nearest subway station. Although the rooms are fairly basic, the hotel is popular due to its low costs, central location, and multi lingual staff. 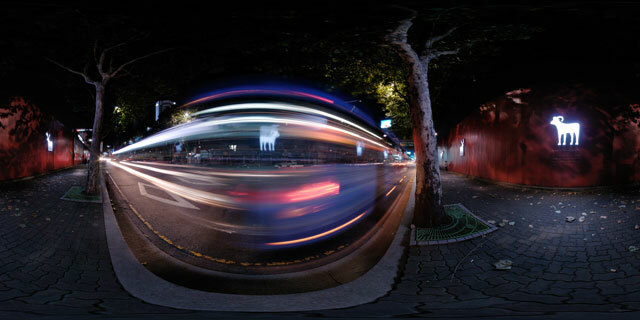 360° VR panorama of a bus passing by the 101 Pine Avenue (101파인애비뉴건) construction site on Euljiro 2(il)-ga, Jung-gu, Seoul, South Korea. The 101 Pine Avenue development consists of 2 buildings, and is proposed to be decorated with 101 works of art and pine trees planted around the buildings. The outside of the boards surrounding the development are decorated with large silhouettes of various animals, which light up at night.